Sophie’s Squash (Random/Schwartz & Wade Books, ages 3-7) by Pat Zietlow Miller with illustrations by Anne Wilsdorf, and reviewed by MaryAnne Locher, is a perfect fall book. 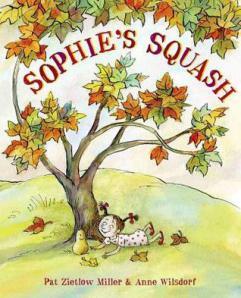 Sophie’s Squash by Pat Zietlow Miller with illustrations by Anne Wilsdorf, Schwartz & Wade, 2013. As parents, we all hope our children will love vegetables, right? Sophie’s Squash by Pat Zietlow Miller and illustrated in watercolor, Chinese ink, and ink by Anne Wilsdorf, gives a whole new meaning to loving your vegetables. I’m not saying that this book will help you get your children to eat their vegetables, but it might save you some money on toys. After all, who needs expensive toys, when a trip to the farmer’s market will get you a squash? This book reminded me of how truly creative children are when we allow them to be. Sophie and her parents bring a squash home from the farmer’s market. Her parents intend to cook it for dinner, but Sophie has already drawn a face on it, wrapped it in a baby blanket, and named it Bernice. Like any good mother would do, Sophie’s mom orders pizza. Bernice and Sophie are inseparable, doing summersaults in the garden, taking trips to the library, and visiting friends at the farmer’s market together. Though “love springs eternal,” nothing lives forever. Especially not a squash that has been bounced and tumbled and hugged. So, who do you go to for advice when your squash looks ill? Why, the farmer who sold it to you, of course. Sophie follows his expert advice, and with a little patience, gets a nice surprise from Bernice! This is a great book of love, letting go, and renewal. I recommend it for youngsters with an appetite for imagination, and for parents to start a conversation about friendships in all its glorious forms. Click here for a fun fall activity. No one will ever take a butternut for granted after reading this charmer.